It could have been a truly excellent film but Ed Harris needed better writing and support. Both Sean Connery and Nicholas Cage put on fine performances with some good support from the other actors. For an adventure film it was excellent and I certainly liked it more than Armageddon. The decision to kill the Seals was silly and exposed the weakness in the sub-plot. By the way if you remember Bush's remark about Putin, "I saw it in his eyes". Sean Connery says the very same thing about Harris to Cage when he tells him that the city won't be attacked. Bay didn't spend enough time on the development of Harris' character or his predicament which lead to the outcome of the story. As a person who loves alot of styles of movies I rarely here this mentioned by fans of the action genre, yet it is one of my favorites. Sean Connery plays his role very well, as does Nic Cage, but it is really Ed Harris who steals the show as the leader of the psycho renegade soldiers. I would recommmend this to any fan of the genre. Don't get the crappy cheap version. It is worth springing for this definative Criterion Collection version. 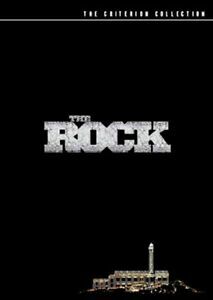 The Rock is awesome, excellent and cool action movie with the awesome cast including, Sean Connery, Academy Award winner Nicolas Cage and Academy Award nominee Ed Harris and the characters are engagingly good! Very good copy, I would order again from them. If you are a Nicholas Cage or Sean Connery Fan, this is the Movie to get. Story takes place in San Francisco and Alcatraz Island. This is a thinking persons action movie. Not only does it have action, suspense and good special effects, the word play between Cage and Connery is priceless. This extended version allows you see a little bit more of the story and plot lines. Highly recommend this Movie. It is a great movie to sit back, late night with popcorn and enjoy.